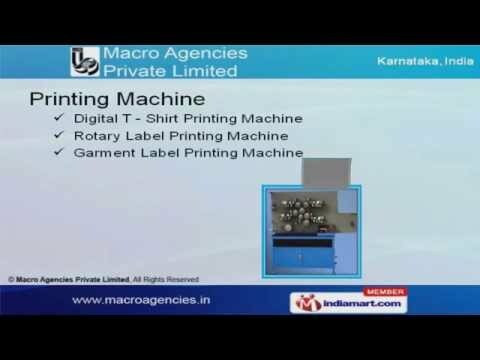 [http://] Welcome to Macro Agencies Private LimitedSupplier of Apparel & Leather MachinesWe are an ISO 9001:2000 certified company, incorporated in 1992 at Bengaluru. Our products findapplication in Apparel, Textile Garment & other sectors. International quality standards, spacious warehousing facility & highly professional approach make usstand apart from also-rans. Our product list includes Embroidery, Printing, Garment & industrial sewing machines. We provide Flat Multi Head, Single Head & Dual Function Automatic Embroidery machines at marketleading prices. Our Digital T â Shirt, Rotary & Garment Label Printing Machines are a class apart. Along with that we provide wide array of Automatic Label Cutters & Ultrasonic Stone Fixing Machines. We also offer premium grade Industrial sewing machine that are best in the industry. Furniture, Piston & Compressors are some of our best selling products.